From what I understand the CV homebrew community works a bit differently than the 2600 one does, in that ROMs are not often posted. I don't have any SGM games yet, as the ones I'm ordering from Team Pixelboy are on back order, so I was wondering if there was an SGM Test ROM that I could drop onto my Ultimate SD? The test ROM could do things like play tunes using the extra sound chip. I know I've read a little about this—so forgive me if it's redundant—but does the Ultimate SD card communicate with the SGM at all? The SGM is mapped to the CPU when connected to the expansion port. The SD cartridge should be able to communicate if a program or software calls for it. I think a demonstration ROM for it would definitely rock. How do you think I beta-tested the four SGM launch games? Also the SD cartridge has bankswitch testing as well. Really awesome cartridge and excellent way of testing your software on a real thing. Hopefully I can figure out how to do bankswitch thingy in the future. There is not a readily available SGM Test Cart or Rom Image currently available to the masses. The only way to test your SGM is with one of the four games that Team PixelBoy released recently that require the SGM be installed in the ColecoVision in order to work. The first two, Dragon's Lair and Zaxxon Super Game, do not offer a built-in test utility accessible via keypad input, but simply will not function without the SGM installed. If you try one of these cartridges without the SGM installed, the actual title screens will display, but then the game will error out and an error message displayed. The second two, Thexder and King's Valley, include a built-in test utility for the SGM that is accessed by pressing and holding a keypad button while the system is turned on with the SGM installed. I, too, think it would be a very good idea to eventually release a SGM Test Utility in rom image format that could be copied to one of the available AtariMax Multi-Carts and run from there. It would kinda follow suit with how Coleco developed test cartridges for the ColecoVision and ADAM Computer for In-House use as well as service centers like Honeywell, but never released them for purchase by end users. As with most things of this nature, these In-House utilities were eventually dumped and made available to the masses by some kind soles on ADAM DDPs and Disks back in the mid-80's. Then later small quantities of repro carts were made followed by Multi-Carts so that ColecoVision owners could use them as well. Edited by NIAD, Wed May 1, 2013 10:18 PM. ADAM owners do not need the Supergame module for Dragon’s Lair cartridge and Zaxxon the Supergame cartridge. So ADAM owners will need to use a videogame that uses the new sound chip in the Supergame module in order to test to make sure the Supergame module sound chip is working ok.
As you mentioned already, hopefully a public domain ROM image will be made available for the AtariMax Multi-Carts so that the Supergame module RAM and sound chip can be tested. 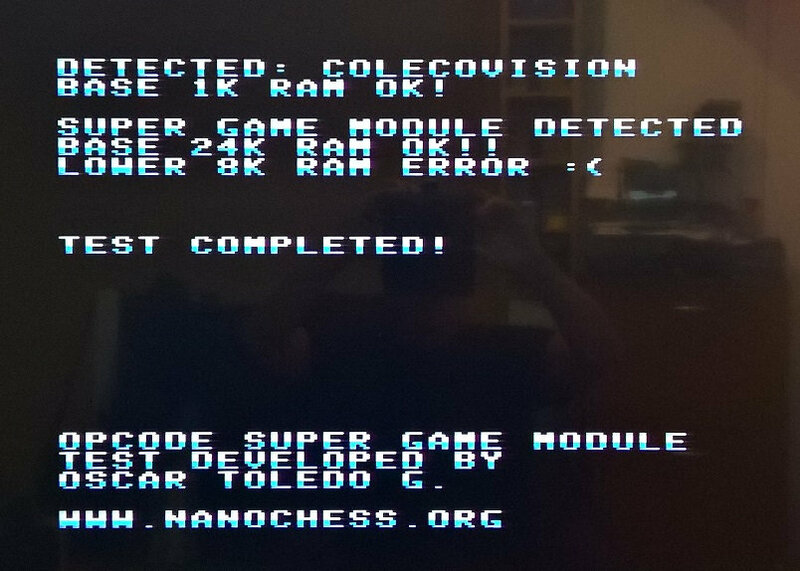 However maybe the Supergame module RAM can only be tested from the ColecoVision since the ADAM does not use the RAM in the Supergame module and only the new sound chip. Edited by HDTV1080P, Wed May 1, 2013 11:28 PM. I can do that, but just not right now, as I am beyond busy. Working on some 3rd party stuff (my final project for 3rd parties for a while), Super Game Cartridge, Opcode Club (which is back on track), packaging for upcoming games with Dale (super excited about those, we are raising the bar very high I must say), and of course ColecoVision 2 (which is actually taking shape pretty quickly, with something that I cannot wait to disclose...). So yeah, pretty busy. I could do a SGM test ROM , just I need to work some days . Edited by nanochess, Thu May 2, 2013 8:02 AM. Cool! If you end up not having time I may try to come up with a demo later this month. I tracked down this last night, it has some of the info I'd need. Of course my CV programming skills are very limited at this time. Hmm - since it's already written it might be easy to make a stand-alone test utility using the existing code. For testing RAM, that would be good, but for testing the sound chip in the SGM, it may be better to have a routine that output a few notes on each channel, just to make sure they all work properly. Eduardo's test routine only displays "SOUND OK" without actually testing the output. Edited by SpiceWare, Thu May 2, 2013 12:40 PM. Actually it displays PSG OK. But you are right, my original routine only tested if the PSG registers were ok or not. Good news!, I've a final version of the utility and it is being tested. 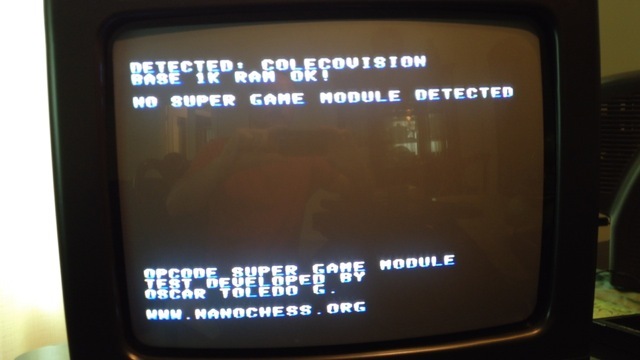 Here is the ROM file for doing tests with Super Game Module. o Detection of Super Game Module. o Check of 32K Super Game Module memory. o Individual test of Super Game Module sound chip. 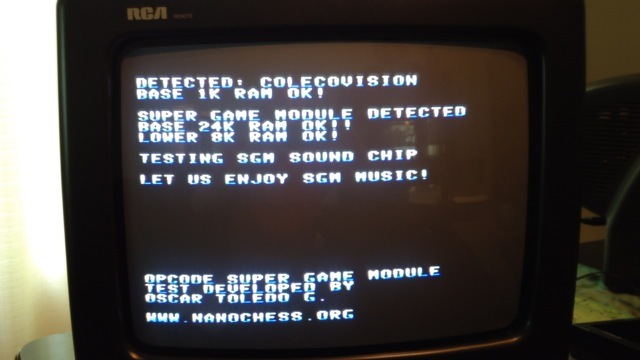 o Parallel test of SGM sound chip with Coleco sound chip. Thanks a lot to Pixelboy, NIAD and Opcode for testing it. Special thanks to SpiceWare for bringing up the need for this utility. Edited by nanochess, Sun May 5, 2013 7:46 AM. Thanks for the test utility. I own the third version of the SGM of 2015. I have the error shown on the picture below. SGM games work well though. Is the error coming from the May 2013 sgm_test program, which would not be compatible with the SGM that came out in 2015 ? Edited by ricky, Wed Oct 17, 2018 7:39 AM. Edited by Pixelboy, Wed Oct 17, 2018 7:46 AM. Unfortunately I can’t provide any input since that test isn’t mine and I have no idea what it is doing. I recommend you use one of my games (self published or not) to test your module. Edit: Press and hold * during power on or Reset. Did you check the auto bios skip feature in your atarimax cart? That is usually the problem.